We’ve shown you the battle ground that is Wall Speedway. We’ve told you how the bracket stacked up after qualifying. 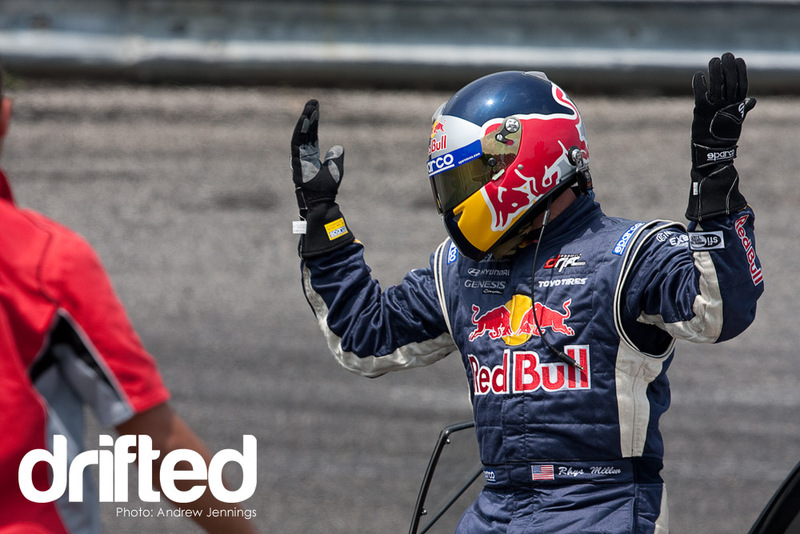 Now it’s time to lay it all on the line as the final drivers went head to head for the podium at Round 3 of the 2010 Formula Drift championship. 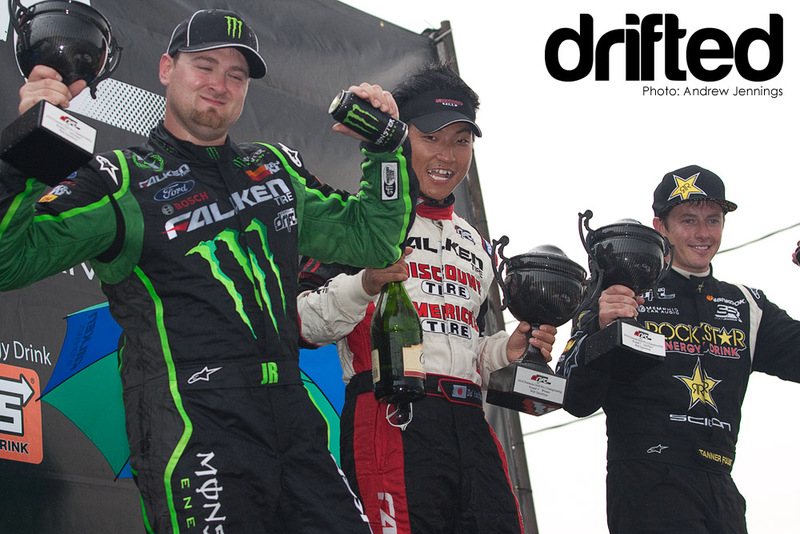 Coming into the event, Vaughn Gittin Jr. was leading the overall points standings by 37 over Dai Yoshihara. New Jersey is Gittin’s home turf, so he was a logical favorite for the crowd. Yoshihara has won at this oval in the past however, standing atop the podium in 2007 when he drove the Rockstar S15. Now that Yoshihara is back in a Nissan chassis, it was anybody’s race to win. Read on to see who would emerge victorious. Aside from Yoshihara and Gittin, third place in the points was Rhys Millen in his Red Bull Racing Hyundai Genesis Coupe. Millen is in his second season with the car, having been way off the pace in 2009, and seems to be getting the hang of it without the massive rear wing. As fate would have it, his arch nemesis Samuel “The Crazy Swede” Hubinette was waiting for him in the first round of 32 battle. These two have clashed many times over the history of the series, each trying to out score the other for the record books. Hubinette is driving a brand new 2010 Dodge Challenger for this season and has yet to see a podium finish. After their first pass, Rhys seemed to have the upper hand, doing a great job of keeping up with the muscle car’s raw horsepower. During the second run with Millen as the leader, things took a turn for the worst. The guardrail at the end of the long first turn had claimed another victim. Millen made the same mistake that Chris Forsberg did in qualifying by first smashing his rear into the barrier, and then getting sucked back in for another hit to the front. 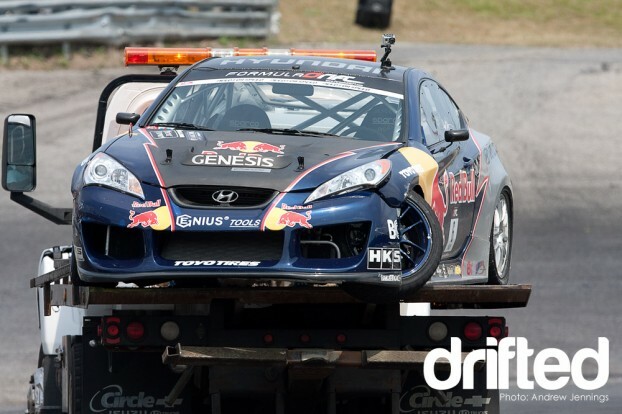 The damage was much more severe for Millen, and although he was unhurt, his Genesis was out of the running. 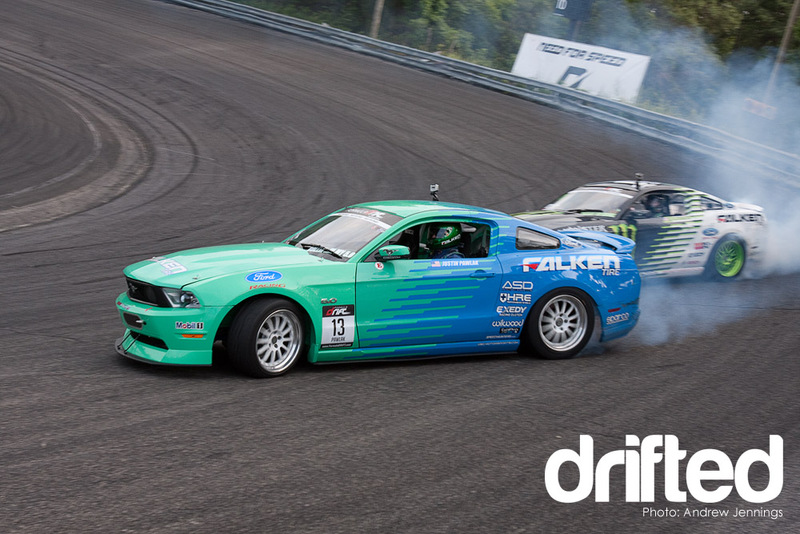 This allowed Hubinette to move on to the next round where he would face the Falken Tires Mustang of Justin Pawlak. In this, what was to be only the first of many muscle car battles, Pawlak emerged victorious and moved on to the great eight. Further down the bracket, Tanner Foust had an exciting battle against Stephan Verdier in the round of 16. 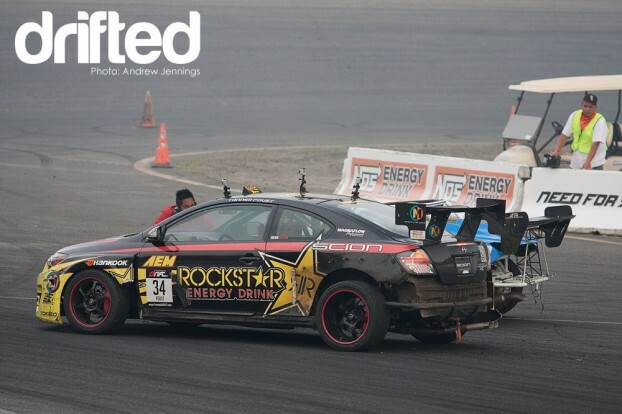 Foust was out for a better result at this year’s event, having not even qualified for the previous one at Wall. In the first heat, he completely smoked Verdier’s Subaru. If Foust is the follower during a second run, he has been known to play it safe in the past and not risk getting too close to the lead car. He had the advantage, so a clean run probably would have been enough. That wasn’t Foust’s strategy, leaving nothing to chance with the judges as he held right onto Verdier’s back bumper throughout the entire run. Lucky for Foust, he could see that Verdier’s line was too deep. Verdier slid his rear bumper against the rail in that photo above as I hovered inches above to get the shot. Impressively, it wasn’t enough to stop the charging Subaru, and their run continued. Foust continued to put the pressure on, and in the final corner something broke on Verdier’s car, causing the right rear wheel to come off of the hub. Since it was the outside corner, the wheel was run over by the body of the car. This immediately stopped Verdier like a spin, and the wheel popped back out at the trailing Scion. Foust too brought his car to a quick stop, narrowly missing both the estranged wheel, and the black car in front. In the photo above, you can see the wheel still rolling on the track as Verdier tried to limp his car away, stunned that this ordeal had just occurred. It’s unclear to me what actually caused the wreck. There may have been something on the course itself that hooked the wheel, grabbing it hard enough to snap off of the brake. Foust opened his door once his car was stopped, and like a baseball umpired he jumped out to exclaim a victorious “SAFE!” He had escaped disaster twice in one run, and advanced to the great eight. Michihiro Takatori, having received a bye to move on to the round of 16, battled Ross Petty in the Falken Tires/Garage Boso S15. Both seasoned Nissan drivers, this was not an easy match to call. In the end it came down to line as Takatori was able to get closer to the edges of the track without disaster while Petty had to shorten up to keep pace. It’s a testament to Takatori’s skill since he was actually sitting on the less advantageous side of the car, farther away from the wall to judge the distance to his rear bumper. Takatori moved on to the great 8, where he would have to face Yoshihara (seen in the lead image at the top of the page). Yoshihara had already defeated Brian Wilkerson and Forest Wang to get there, and wasn’t ready to concede defeat so early in the afternoon. He pulled out an early lead on Takatori, and the supercharged S15 wasn’t able to catch up despite his best efforts. Yoshihara moved on to the final four. 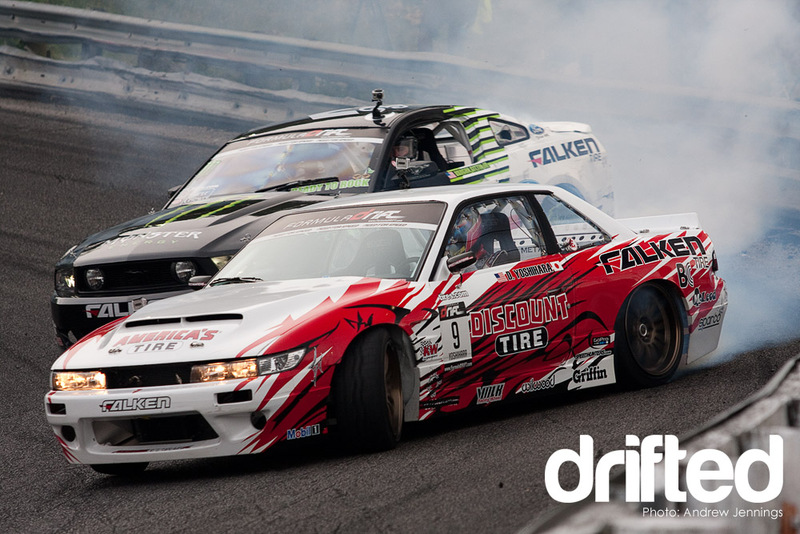 Elsewhere for Falken, Pawlak and Gittin met in the great 8. Although Pawlak showed a great line during qualifying, he seemed unable to find it when up against his more experienced teammate. He entered the banking too shallow, and lost valuable points with the judges. Gittin poured a heavy dose of smoke on his twin in the second run, and moved on to the final four. Tanner Foust’s great 8 rival was number one qualifier Ryan Tuerck. Tuerck led the first run, and Foust fell behind a little bit, holding a solid line but not putting the necessary pressure on. 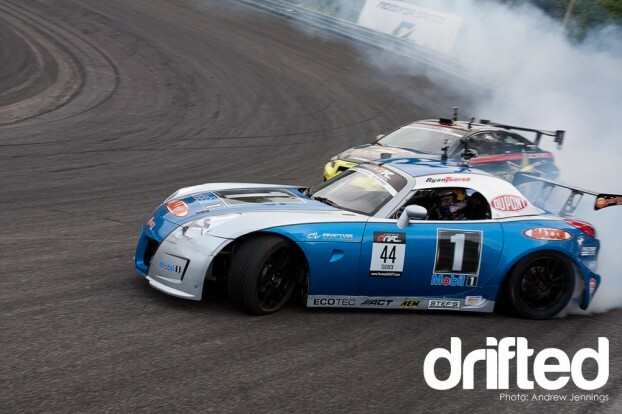 In the second run, Tuerck’s Solstice seemed to lose drift, going off the high line similar to Petty in the earlier match. As Foust held his line for the second half of the match, he solidified a close win to edge out the Solstice and move on to the final four. Rounding out the four was the Irish invader Darren McNamara in the Falken Tires Saturn Sky, assuring the team at least two of the three podium spots. He would have to face Yoshihara first, and it proved to be a battle of epic proportions. The first runs were solid on both sides, causing the judges to take things to an One-More-Time (OMT). As McNamara lead going into the banking, both initiated their drifts very early. The little roadster may have been too ambitious, and his rear bumper caught the wall, sending him back up for a wild ride. His car slid around the barrier, ripping apart his front bumper and dislodging his left headlight. In the photo below, you can actually see the headlight housing in mid air as it is kicked back up and away from the car (right towards yours truly!). Luckily no parts of his car made it over the wall to harm this gutsy photographer. 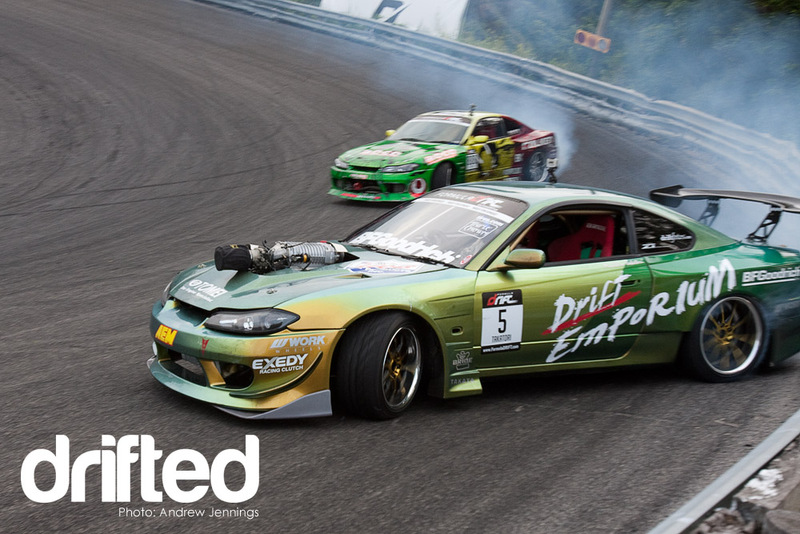 The crash proved once again why Formula Drift dubbed this round “The Gauntlet.” Although the track looks wide open, there are surprises lurking at almost every corner waiting to catch a driver out. McNamara’s mistake left the door open for Yoshihara to advanced to the final. Foust and Gittin’s match was more straight forward (not literally, this is drifting after all!). Both had clean runs, but Gittin showed his dominance, inching away from the black and yellow Scion to grab the win. Miraculously, the Falken team was able to repair McNamara’s car with enough tape and zip ties that it would hold up for the consolation round. Foust could not afford to let another car slip from his grasp, dropping to a shallow line in the first heat to keep pace with the agile Saturn. In their second run as Foust led, things were looking good for McNamara. He had kept pace throughout the whole course burning serious tire smoke. At the exit to the final corner, he was following too close and hit Foust’s left rear quarter. The blow was hard enough to knock off Foust’s rear fender and bumper, spinning him through the finish line. The judges ruled that McNamara was at fault, and awarded Foust the third place victory. 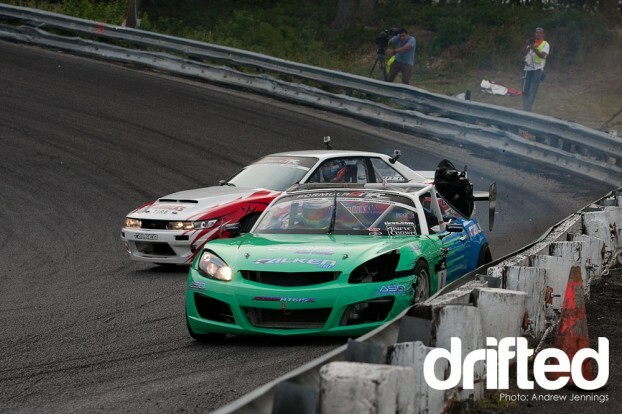 I mentioned in my opening to the Wall that rear bumpers were optional in Formula Drift, and I think that photo says it all. For fans who recall the final in Atlanta, it was deja vu all over again. Gittin went up against Yoshihara to see if last month’s result was a fluke, or a sign of who wore the fire suit at the team. Neither was ready to just give this win away, putting on a flawless display of driving. Where I stood, it was too close to call a winner, but the judges knew right away. That’s right, Dai Yoshihara, driving a Nissan 240SX for the first season since 2007, took the win at Wall. It was a back to back victory for him, and three in a row for the team so far this season. And, up to present the trophies was Miss Formula Drift 2010, Melyssa Grace. What was I saying again? Oh yeah, congratulations to Dai Yoshihara, Vaughn Gittin Jr., and Tanner Foust on their spectacular performances at Wall! Gittin still leads the points standings, but Yoshihara is nipping away at his heels in second. Foust moves into third, but the season isn’t even half over. 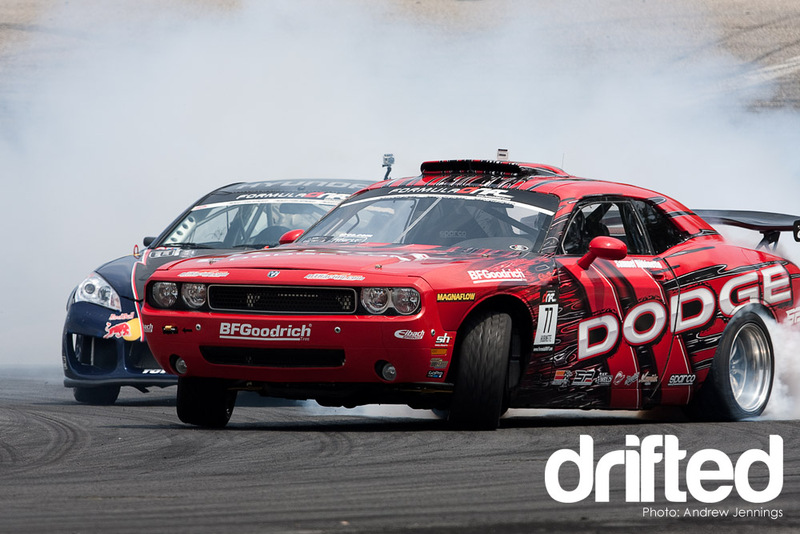 There is lots more action in store for 2010 so keep your browsers here with Drifted to see how Round 4 at Evergreen Speedway shakes out!